9 This is a faithful saying and worthy of all acceptation. 10 For therefore we both labour and suffer reproach, because we trust in the living God, who is the Saviour of all men, specially of those that believe. 11 These things command and teach. 12 Let no man despise thy youth; but be thou an example of the believers, in word, in conversation, in charity, in spirit, in faith, in purity. 13 Till I come, give attendance to reading, to exhortation, to doctrine. 14 Neglect not the gift that is in thee, which was given thee by prophecy, with the laying on of the hands of the presbytery. 15 Meditate upon these things; give thyself wholly to them; that thy profiting may appear to all. 1 And Jesus entered and passed through Jericho. 2 And, behold, there was a man named Zacchaeus, which was the chief among the publicans, and he was rich. 3 And he sought to see Jesus who he was; and could not for the press, because he was little of stature. 4 And he ran before, and climbed up into a sycomore tree to see him: for he was to pass that way. 5 And when Jesus came to the place, he looked up, and saw him, and said unto him, Zacchaeus, make haste, and come down; for to day I must abide at thy house. 6 And he made haste, and came down, and received him joyfully. 7 And when they saw it, they all murmured, saying, That he was gone to be guest with a man that is a sinner. 8 And Zacchaeus stood, and said unto the Lord: Behold, Lord, the half of my goods I give to the poor; and if I have taken any thing from any man by false accusation, I restore him fourfold. 9 And Jesus said unto him, This day is salvation come to this house, forsomuch as he also is a son of Abraham. 10 For the Son of man is come to seek and to save that which was lost. 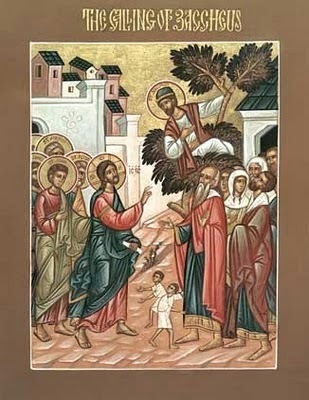 Thou wast a guide to the Way of Life,/ a first Hierarch and a teacher;/ thou didst come and enlighten thy home country, O Sabbas,/ and give it rebirth by the Holy Spirit./ Thou hast planted thy children like olive trees in the spiritual Paradise./ O Equal-to-the-Apostles and Saints,/ pray to Christ our God to grant us His great mercy. Strengthened by the power of faith,/ thou didst contend for Christ our God, O glorious Tatiana;/ thou didst endure every affliction/ and by thy courage put Belial to shame./ We beseech thee to deliver us from the power of the evil one. Thou hast appeared today to the world,/ and Thy light, O Lord, has been signed upon us/ who with full knowledge sing to Thee./ Thou hast come, Thou hast appeared,/ O Unapproachable Light. Thou art glorified as a great Hierarch and companion of the Apostles;/ and as thou hast boldness towards Christ God save us by thy prayers,/ that we may cry: Rejoice, O wise Father Sabbas. Thou wast radiant in suffering, Tatiana,/ and in the royal purple of thy blood thou didst fly like a dove to heaven./ Wherefore pray unceasingly for those who honour thee.